Lost in the Movies (formerly The Dancing Image): Where is Mulholland Dr.? For months now, I've been slowly making my way through 1001 Movies You Must See Before You Die (usually in the bathroom or bedroom, as it's difficult to transport it elsewhere). It's a nifty tome to have on hand, and since I bought it at a discount I don't regret the purchase. That said, most of the prose is merely serviceable, despite the occasional splash of liveliness (usually courtesy of Jonathan Rosenbaum or, especially, Jean-Michel Frodon). What's more, the descriptions, while attempting to be succinct and introductory, are often burdened by academic jargon and strained sociopolitical readings - as if the authors can't decide whether they're writing for scholars or laymen. There are also a surprising number of gaffes, grammatical and factual, throughout the book. Granted, a tome this size (nearly 1,000 pages) must have been hard to edit but a cursory check-through should have taken care of most of the mistakes. 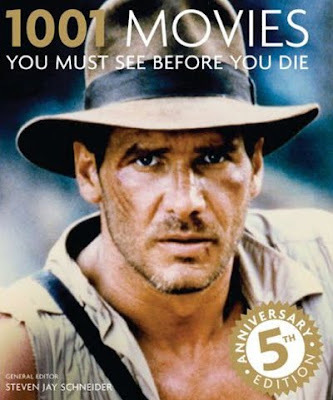 At any rate, despite its flaws, the book mostly serves its purpose, which is to establish a rough canon of the most talked-about, popular, and/or acclaimed films in history - if not 1001 films you must see before you die, at least 1001 films you should probably know about. However, there's one startling omission which throws the whole enterprise into question. Tonight, I was reading the entry for Lord of the Rings - all three films squeezed into two pages. True, I have my problems with the trilogy but, given its impact, its popularity, and the critical acclaim which greeted it, the saga certainly belongs in the book. As I turned the page I looked forward to another entry from 2001: Mulholland Dr. David Lynch's masterpiece, which aside from being a personal favorite (and what I consider one of only two or three great American films I've seen this decade) is also one of the most acclaimed films of the 21st century. It's controversial, to be sure, but about as noteworthy as cinema gets in the 2000s. In other words, an absolute no-brainer for this book, something I think even opponents of the film could recognize. Yet on the next page was The Pianist. But that meant we were already into 2002, and no sign of Mulholland! I was immediately perplexed; had they gotten the wrong year for the film? (It wouldn't be the first time.) But no, as I flipped back and forth it became increasingly clear that they just hadn't bothered to include Lynch's movie. Huh? To me, that's inexplicable. It fits all the criteria for inclusion, there's plenty to discuss (just think what Frodon could have done with it! ), and it's certainly a more obvious inclusion than, say, Meet the Parents, which greets us a few pages earlier. What's going on here? A massive typo in which a whole entry was accidentally excluded? I must admit I'm perplexed. What's the point of a canon which doesn't include what is by many accounts the best film of our young century? The best film of "our young century" as you astutely call it is Todd Haynes's FAR FROM HEAVEN. Was that film in the book? No - they missed that too! Only six films from 2002. But not to worry, Little Miss Sunshine is present. Looking over it now, the book pretty much falls apart in recent years; up until then it does a surprisingly good job hitting not only the familiar classics but lesser-known gems like Daisies. But it's assessment of what's worth writing about in the 00s defies common sense. I just don't get it. Keep your eyes peeled. There are multiple versions of this book, and each successive one re-jigs the criteria on what is and isn't "essential". 'Course, I'm still not sure if MULLHOLLAND is in the latest one (The one with Heath Ledger's Joker on the cover). It was in the previous year's (or maybe the year before that) version, which I have. I would imagine that closer to 2001 it made the cut. But it looks like they beef up the most recent entries and ennervate the next-most recent entries with each round. Of all the films they dumped for 2000/2001/2002, why Mulholland Dr. (or Far From Heaven for that matter)? It's possibly the most acclaimed of the bunch - second only to In the Mood for Love on the most definitive round-up of critical opinion. Of course, that's not the only criterion for inclusin, but it's certainly one of the most important. Any list like this that leaves off Mulholland Dr. is pretty much worthless as far as I'm concerned. As much as I like Haynes' film as well, Mulholland Dr. is definitely the best film of the 00s and one of the enduring landmarks of cinema. If that's not worth seeing, what from recent years is? But then books like this generally aren't really that concerned with cinematic quality, are they? They're marketing gimmicks. The book is definitely a marketing gimmick but the writers engaged to describe the films, and many of the films chosen, suggest that behind the marketing gimmick was a genuine attempt to determine and celebrate the greatest films of all time. My guess would be that the marketing gimmick aspect takes over in recent years, but even so why EXCLUDE Mulholland Dr.? It's certainly not more obscure than some of the other films they pick from recent years (a strong effort to include international art films is made throughout). I just don't get it - it just seems like an oversight. I will say that an earlier version of this list, in conjunction with at least a dozen others (including the They Shoot Pictures Don't They top 1000) has allowed me to compile a very strong canon which has guided my film-viewing for the past few years. So in that sense it served its purpose, but should definitely not be taken in isolation. My suggestion? Let's write and publish our own book with a far more passive-aggressive title: "1002 Films You Must See If You Want To Live". Slap a gun-at-the-camera still on the cover (a la The Great Train Robbery) and threaten everyone with violence in the exordium. It would probably sell at least as well as David Thomson's "Have You Seen". I'm on board, Jon! Frankly, the up-side of this whole "marketing gimmick" style of selling books, as Ed refers to it, is that it hardly matter what's inside as long as the concept and the cover's catchy: heck, it can be intelligent even! Case in point: that "100 Most Influential Books of All Time" book, published by Barnes & Noble no less which contains a number of entertainingly opinionated (and hardly circumscribed) essays by someone named Martin Seymour-Smith, who, among other things, loves to throw in vicious attacks on Richard Dawkins from time to time, apropos of hardly anything. Do any of you guys think there is a generation gap concerning Mulholland Drive? I've brought this up to some of you before in discussing the movie. And you guys know I love Lynch's work. The film also made my top 10 for 2001, of course. But it ranks nowhere near as high on my top films of the 2000s as it does for you guys it seems. I'm still a sucker for early Lynch like Blue Velvet. There's just something a bit too on the nose Lynchian about it for me. That's an enlightening comment. Blue Velvet was my introduction to Lynch back in 1986(I saw Dune in 1984, which I liked up to a point, but it is the most atypical Lynch movie so I don't count it... interesting though, from the perspective of seeing him begin relationships with actors that would later prove significant in his body of work). But it may have gone over my 14-year-old head because I disliked the quirkiness. It wasn't until I saw Twin Peaks four years later that I finally got it. With Peaks serving as a sort of gateway work for me, Blue Velvet became my fave upon revisiting it afterwards. "I think that if you love Lynch, whatever Lynch movie you saw first is the one that holds a special place for you." Blue Velvet was the first Lynch film I saw. I didn't like it and still don't. I'd seen virtually all of his films before I saw Fire Walk With Me, which blew them away to such an extent that it made the others feel a bit try-hard - "on the nose Lynchian" as Tony said. Stephen, I too didn't much care for Blue Velvet when I first saw it, except for Dennis Hopper's performance. But it's grown on me over the years, though it's appeal is still more cerebral than visceral - which is really unusual with Lynch. I think I might have liked it better if I hadn't seen Mulholland Dr. first and been mentally comparing it. Ed and Tony, I think you're both onto something. Not counting Elephant Man, which does have a number of Lynchian elements but isn't "pure Lynch" like some of the others, Mulholland Dr. was my first Lynch, and I fell hard. And Tony, the thing about the generations is that it corresponds to a split in Lynch's work - a split which I think you noted first. Twin Peaks, and Fire Walk With Me, serve as a nice divider line between the more stylistically restrained, male protagonist, less overtly mystical works and the looser, female-centered, much more tangibly spiritual films (though I guess the fact that a male is the lead in Lost Highway kind of disrupts the theory, I'd consider it the exception to the rule). Twin Peaks, and Fire Walk With Me, serve as a nice divider line between the more stylistically restrained, male protagonist, less overtly mystical works and the looser, female-centered, much more tangibly spiritual films (though I guess the fact that a male is the lead in Lost Highway kind of disrupts the theory, I'd consider it the exception to the rule). Interesting point, Joel. It was also around this time that Lynch began meditating, if I'm not mistaken (Agent Cooper's vague mysticism was a nod to this), which could have contributed to the shift (it would at least partly explain the later emphasis on spiritualism). "...(though I guess the fact that a male is the lead in Lost Highway kind of disrupts the theory, I'd consider it the exception to the rule)." Let's not overlook another great Lynch movie that is a throwback to his more "stylistically restrained" period (and also features a male protagonist), the elegiac A STRAIGHT STORY starring the great Richard Farnsworth in his last role before he took his own life. Yeah, I should note that when I'm making generalizations about the work or noting trends I'm focusing on the most "Lynchian" films, excluding Elephant Man, Dune, The Straight Story ... plus I haven't seen the latter two (or the first one since I was a kid), so that probably plays into it! Probably they put Blue Velvet in, or the Elephant Man or something... and didn't want to put too many films in by one director. What was the maximum number of films a director got into the book, out of interest? Ben, thanks for dropping by. There was no formal limit to how many films by one director could get in, though that obviously played a part in their decision-making. I never really went off Mulholland Dr. but there was a point at which I cooled on it a little, wondering if maybe it "explained" too much and would be better off as pure irrational dream. But I've warmed to it again and decided it I like it even more for its "explanation."